Chugga-Chugga Choo-Choo... 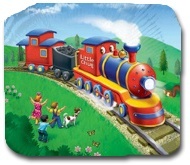 Celebrate your little train lover's special day and make it memorable with our "Little Chug" train theme birthday party line. Climb Aboard! Little Chug is here to take you on an adventurous ride. The pattern features the little red engine along with a coal car and a caboose at the end chugging down the mountain while the kids are waving at her. Bright colors. Recommended age range 2 to 5 years. Proudly made in the USA.